At the heart of all Pixar films there is a journey. There’s the journey to get the thing or the person to the place in order to save the day. This is a template Disney and Pixar have used time and time again in order to ensure a structure and beats that the youngest of audience members can seemingly recognize and appreciate, but I didn’t consider this initially. As an adult viewer I was simply bummed to discover that the studio was once again leaning on this crutch in Coco in order to convey what seemed to be a unique narrative from a marginalized culture. Inside Out did the same thing when it took all of these original ideas and concepts it had and then used them in service of the heroes journey arc we've seen countless times before, and especially in films whose target audience is largely children. What Inside Out did to ultimately reverse this expectation by the end of the film was to of course use that template in service of those original ideas and concepts as a way to explore them as well as the ideas and themes the filmmakers were keen on conveying. It worked. I teared up. 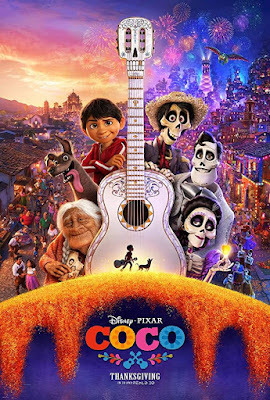 Coco more or less does the same thing in that this is a heroes journey of self-discovery for our protagonist, Miguel (voice of Anthony Gonzalez), and it is an entertaining one at that, but while these familiar beats are present to allow the younger audience members a sense of connection and understanding it is the emotional strands of family, legacy, and pride in that family history that are woven throughout this otherwise standard structure to be the connective tissue for what Coco is truly meant to represent. This dawned on me as the credits began to roll and I was feeling content with what I'd just experienced if not bowled over by the visual prowess that Pixar is now achieving, but as I looked down at my three year-old daughter sitting next to me and asked her if she enjoyed the movie it became obvious as to why there needs to be this accessible structure by which the character's and their story arcs relate to younger viewer's otherwise Pixar would strictly be making films for adults. Pixar does make films for adults wrapped in the facade of colorful children's fables, we've known this for years, but with Coco it became more evident why this approach has been so important in that, as my three year-old grows up and continues to watch Coco, she will only gain more from it on each viewing. In this way, Coco carries on the great tradition of Pixar while continuing to diversify and expand that special brand it has now seemingly perfected. 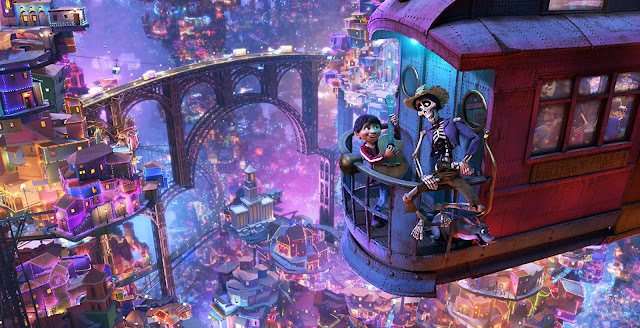 Miguel (Anthony Gonzalez) somehow crosses over to the Landof the Dead while still being very much alive in Coco. Beginning with a great epilogue as told through the decorations hanging in the small village where our story takes place we are first informed of the history of the Rivera clan and why they have been shoemakers for generations upon generations as well as the small detail of why they hate music and why everyone in the Rivera family has been banned from both listening to and playing music. Naturally, this restrictive (and frankly ridiculous) rule against music doesn't jive well with the young and exuberant Miguel (I get it, it's a plot point, but so extreme!) as he idolizes a famed singer known as Ernesto de la Cruz (voice of Benjamin Bratt) who has long since died, but is still known as one of the greatest musicians in the history of Mexico. We come to meet Miguel on Día de los Muertos, the Mexican day of the dead, where Miguel's family is preparing their altars and food in honor of family members who have died before them. While Miguel struggles with his identity as part of the Rivera ancestry and wanting to strike up his guitar and perform in front of his small village of Santa Cecilia it is his Abuelita (voice of Renée Victor) who puts her foot (which may or may not have a shoe on it, depending on if she's thrown it at Miguel yet) down definitively on where Miguel's future stands. His parents, Luisa (voice of Sofía Espinosa) and Enrique (voice of Jaime Camil), side wholly with Abuelita though Miguel's great-grandmother, Mamá Coco (voice of Ana Ofelia Murguia), seems to still have a soft spot for the sounds and melodies music produces despite it being her mother, Imelda (voice of Alanna Ubach), who banned music in the first place due to Coco's musician father walking out on his wife and daughter when Coco was only a small girl. Despite his family's words of warning Miguel can't help but to want to play music, signing up for a talent show that takes place in the town square on the night of Dia de los Muertos. The only problem is, Miguel needs an instrument-a guitar-to play his music ultimately deciding his only option is to break into the mausoleum of de la Cruz and steal his guitar. However, in the midst of obtaining the guitar Miguel becomes a type of ghost unable to be seen or heard by the living except for Dante, a street dog he's taken to. In the cemetery, Miguel meets his deceased relatives who are surprised that Miguel can see them and is there with them and immediately connect it with Imelda's inability to cross to the other side. This prompts his family to take Miguel with them to Land of the Dead, an afterlife dimension where the deceased live outside of being able to come visit their relatives on Día de los Muertos. There are several things in Coco that are worth noting, but what struck me almost immediately was the flawlessness of the images and the rendering of this fully fabricated world that felt tangible in ways Pixar hasn’t reached before. There are certain shots in Coco where the animation combined with the camera movement make it feel as if one could visit this Land of the Dead if they so desired. It’s visceral and immersive which aren’t terms I use lightly, but it is arguably Coco’s strongest trait. Both the unprecedented quality of the animation as well as the world building that occurs. To draw comparisons once more with Inside Out the environment that is Riley’s brain, while layered and inventive, can’t touch the authenticity that is the norm in Coco. This Land of the Dead is a real, lived-in community where the world economy is solely based on the memories of the living. The currency and therefore the livelihood of these spirits, these already dead, but still very much alert beings, depend on how great their legacy lives on in the hearts and minds of those who knew them. And so, someone like de la Cruz, who was adored by millions, continues to live a lavish after life whereas someone such as Héctor (voice of Gael García Bernal), who can’t even cross over to the land of the living on Dia de los Muertos because no one puts out his picture, stands to be forgotten completely and is relegated to the slums. It is in the introduction of Héctor that the film begins to really dig into both this world as well as some of the deeper themes writers Matthew Aldrich and Adrian Molina (The Good Dinosaur), who co-directed the film with Lee Unkrich (Toy Story 3), are interested in discussing. While the animators spoil the audience in lavish production designs-wide and aerial shots of the neon-lit cityscape of the Land of the Dead are worth the price of admission alone-and fantastical creatures that are typically a mash-up of a jungle animal and wings as viewed under the most intense black light ever and come to be known as spirit creatures are among other visual treats Coco consistently delivers, but as it turns out it is actually Héctor that comes to serve as the audiences spiritual guide through both the Land of the Dead and the movie itself. 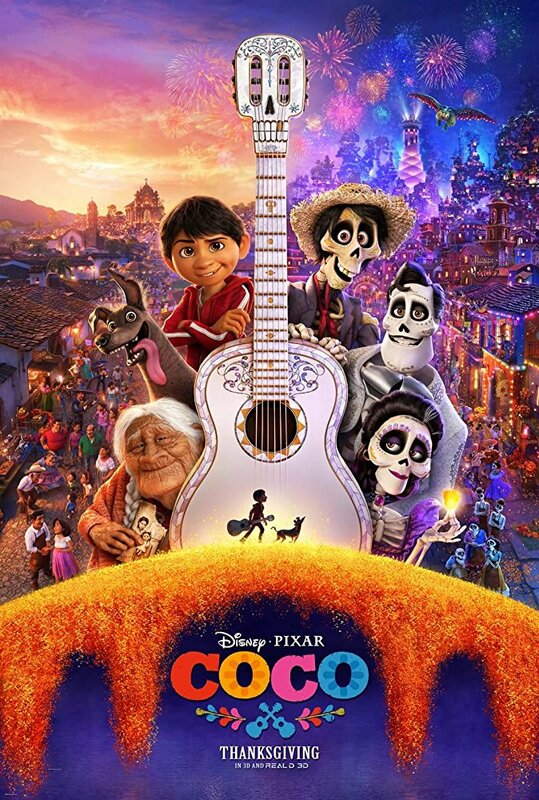 You see, Coco does this weird thing where it begins with an intriguing enough concept through this celebration of Día de los Muertos, but if you saw The Book of Life from a few years ago you'll quickly realize this isn't the most original lens through which to take this journey of self-discovery, but Pixar knows that as long as the story itself is striking enough that similarities in look and tone and backdrop will come to matter very little. This is true as Coco quickly steeps us in the Rivera experience, reminding us that we're all more alike than we are different, before plunging us into the thick of the plot where we already know we'll be satisfied with the outcome because this world that has been created is so exciting to exist within. Where the movie gets you though, is with the introduction of Héctor and the realities of the afterlife we come to be made aware of through Miguel's interaction with him that strengthens that aforementioned connective tissue. Miguel and Héctor (Gael García Bernal) get to know one another via jam session. Legacy is something that has seemingly always been squabbled about. Specifically, the conflict of whether it is more important that you make a great and lasting impact on those closest to you that you love and who love you back or if the more venerated path of being regarded with great respect and honor by countless numbers of people, most of whom one will never meet, is the more rewarding one. Coco gives one of its characters this choice, exemplifies the inner-struggle associated with said choice, and then adds tragedy to it by sprinkling in plot points that serve to emphasize the constructs of this world they’ve built. That connective tissue specifically coming into play when a character, a dead character, must ask themselves if they’re going to be remembered long enough to see the ancestor who is the last one to remember them one final time. It was this moment in the film when what Aldrich, Molina, and Unkrich were trying to accomplish hit me in a way I didn’t expect and frankly, wasn’t prepared for. 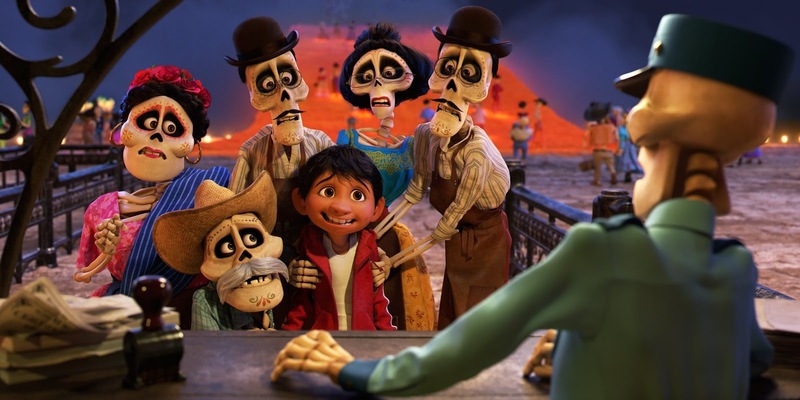 There are tons of movies every year that claim to be about the importance of family, but often times these “messages” feel more like scape goats of morals given the broad range of examples that can be shuffled under such an umbrella idea, but with Coco it's clear this isn’t just a message or vague thesis, but something the movie genuinely means when drawing these supporting characters who are deeply concerned with those who come after them and how they are remembered; not only for their own sake, but because it is vital to them that they make their family proud. This is the lesson Miguel must ultimately learn. It’s not about defying your family out of spite, but earning their respect so as to feel blessed with their endorsement in any path you choose. Everyone needs a support system and Coco is most genuine in relaying why it’s vital to keep those ties that bind as strong as possible. Yes, the film can be fairly predictable and if you’ve seen any movie ever in your life you can probably see a certain twist coming from a mile away (my wife and I figured it out about mid-way through the second act), but this goes back to the story beats not being for the adults-these are for the kids and these are fine enough as they are-for Pixar saves the more poignant idea of not being relegated to being one of the forgotten that dissipates even in the afterlife for the adult gut punch just when you think you might get out unscathed. This was always next to impossible, especially considering the added value of Michael Giacchino’s score and a handful of original songs penned by Frozen songwriting duo Kristen Anderson-Lopez and her husband Robert Lopez, but while Coco may feel familiar in certain aspects it is truly a startlingly beautiful contemplation on the ones we leave behind, what we leave them with, and how resolved we need to feel when our time comes for the sake of our own contentedness. It’s heavy stuff for a PG-rated adventure/comedy so it’s a good thing those tropes and that predictability are there to rope in the movie from becoming too heavy-handed leaving us with this engulfing, enjoyable, and meaningful film that can be embraced by the whole family because it’s about family in the truest sense of the word.